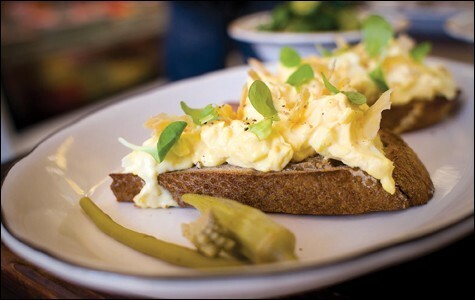 The open-faced Okayo sandwich, topped with egg salad and crispy chicken skin. Grand Lake Kitchen quickly became a hit when it opened in Oakland’s Adams Point neighborhood in 2012. And in 2016, it expanded into the business next door, adding a still-packed dining room to its deli-grocery-eatery. Brunch lines remain epic. Now, Grand Lake Kitchen is preparing to open a second location in the Dimond District. Co-owners May Seto Wasem and David Wasem have secured the former Full Moon Seafood House space (2042 MacArthur Blvd.) and hope to debut the new restaurant in fall 2018. The original Grand Lake Kitchen will remain open. The Dimond location will be far more spacious at 5,500 square feet. Seto Wasem said they’ll be able to do a lot more with the grab-and-go deli aspect and create a layout that makes dining in or picking up takeout similarly convenient. The aesthetic will probably look similar to the original but Seto Wasem expects it to eventually take on the vibe of the neighborhood, just like the original Grand Lake Kitchen did. As for the food, expect more all-day fare like creative sandwiches and spins on Jewish deli classics as well as lovely American comfort food. Seto Wasem and Wasem reside in the nearby Redwood Heights neighborhood and said they feel like there’s demand for more dining options in the area. “This is where we live so we’re really excited to have our business in this community,” Seto Wasem said.